Jamo announces the arrival of its A 101HCS5 'pint-sized' sub/sat system | What Hi-Fi? Not everyone wants big speakers cluttering up their living room, so Jamo has developed a 'pint-sized' sub/sat home cinema system. 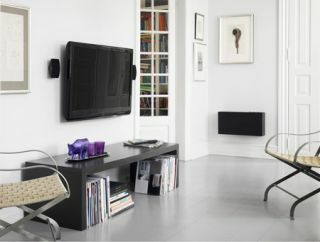 The £300 Jamo A 101HCS5 uses rectangular satellite speakers that are just 5cm deep, can be mounterd vertically or horizontally, placed on stands or hung on a wall. There's a matching active subwoofer, which can also be hung on a wall, and all the speakers are finished in gloss black or white lacquer. Inside the satellites are a newly developed 7.6cm driver, while the 16cm-deep A 101SUB is equipped with a 200W amplifier and twin 20.3cm drivers 9one active, one passive). The Jamo A 101HCS5 5.1 system is available now online and from Jamo retailers across the UK.